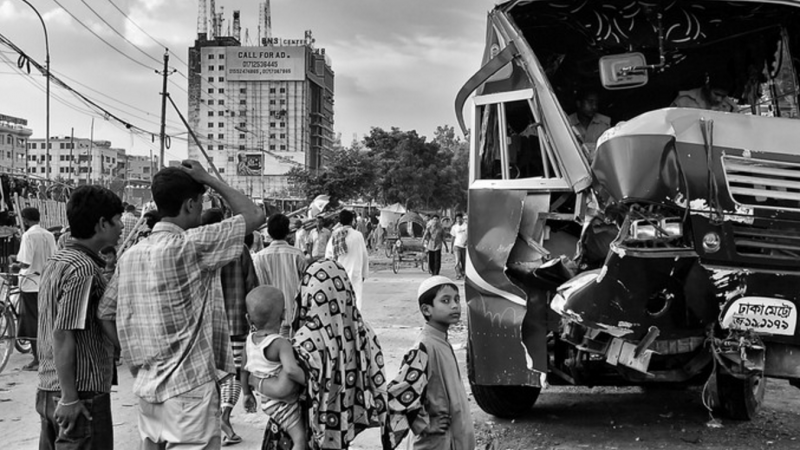 Road accidents are a major problem in Bangladesh. Statistics show that every year, nearly 4,000 people die in around 20,000 road crashes across the country. And some of those deaths might have been prevented had nearby hospitals not refused to give emergency treatment to them, instead diverting them to government hospitals. In the absence of countrywide health insurance coverage and affordable health care, private medical clinics and hospitals often turn away unknown accident victims because of financial insecurity they represent. In this context, the High Court of Bangladesh handed down a landmark ruling directing the government to ensure that all doctors and hospitals — no matter private or government-run — provide emergency medical service to accident victims. In a few seconds what I see – the experience is surreal. A man trying to get onto a bus which was moving through the traffic. He slips and the same bus runs him over. He in on the road and raises his hand. I press the brakes of my car. The car behind me hits mine. Vehicles still running like crazy around me. Honking goes on.. I cant get off the car yet. I get off and run to the man. A bus was approaching us from the left. I pull his hands to save it from being run over… People on the walkway, first look. As I begin to scream for help. They block the road from at least one side. I rush to get water from my car. His lower body was smashed. There was no blood but white mass.. I had never seen human muscle this close. He tried to get immediate medical help for the victim, driving him to three nearby private hospitals, which all refused to admit him. Bangladesh doesn't have any 911 emergency number to report road accidents. Also, less than 10 percent of accident victims are served by ambulances due to lack of vehicles and road congestion. Dodging the traffic, I rush through as quick I can to Lab Aid in Gulshan 2. They tell me NO. Then I went to Shikder Medical. I asked if there is an emergency. They tell me yes. I park the car. The security takes a look at the man and says ” no we cant serve here, take him to Sahabuddin”. I get to Shahabuddin. I scream for help at the emergency. They get the stretcher. The doctor stands casually at the door waiting for assistants to pull the person out. I lose it and scream at him. He then comes and checks the patient. Who is still alive and gasping. The doctor refuses to serve tells me to take him to Dhaka Medical (government) ASAP. I asked why? “I will give you the money but please help. He will die by the time I get him there. Its heavy traffic”. He refuses! Then with the help of the police, Kamal headed to Kurmitola General Hospital, but the victim died on the way. Kamal filed a writ petition to the High Court in response to the ordeal with the help of Bangladesh Legal Aid and Services Trust. So, whom do we claim to be the actual killer? The bus driver? The screwed up traffic system of Bangladesh? The amazing crowd out there who didn't bother to come and help? The doctors whose first and foremost duty is to “serve” their patients? OR US because we the so called educated society can actually work as one team to bring a change, but we are too busy to care? And the saddest part, events like this are so common here in Bangladesh but a man like Mr.Saif Kamal is too hard to be found. ‘Where is our value system'? If a hospital refuses a critical accident victim, that in reality expedites the victim's demise. A hospital is not a grocery or a fast food place that can deny a customer whom they don't like. If you notice, you will see most of the private medical hospitals refuse to admit those patients (and redirect them to a government hospital). Commerce plays a big role here. If any victim dies in hospital with lack of treatment (which may be expensive) and if that information is leaked to a newspaper then the hospital or clinic will get a bad reputation. So they refuse to admit critical accident patients. The annual economic wastage due to traffic accidents in Bangladesh is estimated to be 2 percent of gross domestic product. About 30 percent of the national health budget is spent on victims of road accidents. I could not admit my friend to a hospital who was hit by a car. They told me that its a police case and I should first lodge a complaint. There should be a clear law regarding this. In principle, we cannot support the refusal of hospitals to admit critical patients. I don't know about the legal issues (or the complications), but those hospital which advertise that they have a 24-hour emergency service and do not admit critical patients should be brought under law. Saif Kamal raises some critical questions and Bangladesh needs to respond. We need to respond. Where is our value system with so many religious worship places? The desperate condition in the traffic system and human traffic in the roads are scary. [..] The government and the public in general need to address these issues because the scary life that this poor conductor faced may be awaiting you or your dear ones. On 10 February 2016, about three weeks after Saif Kamal's experience, the High Court directed respective government ministries and authorities to explain why hospitals and clinics, whether governmental or private, refusing to provide emergency medical services to critically injured people should not be declared a violation of the fundamental right to access emergency health care. It also ordered the Ministry of Health and Ministry of Road Transport and Bridges to work towards ensuring emergency treatment for all. According to the Accident Research Institute of Bangladesh University of Engineering and Technology, one of the main causes of traffic accidents is the poor condition of the road. Sixty percent of the country's main roads are in bad condition. Moreover, accident incidents occur due to unfit cars and inexperienced drivers. Reportedly, a total of 85 percent of the people in road accidents who die do so before they reach the hospital; many could have been saved with faster access to medical care. Bangladesh's health policy says that “every citizen has the basic right to adequate health care.” But the absence of health insurance, inadequate hospitals, and the lack of doctors and medicine are the main impediments to making that noble goal a reality. Hopefully, the court order is the first step towards better medical care for road accident victims.